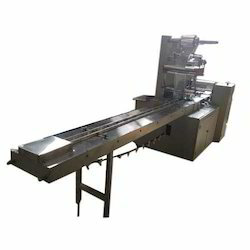 - We are dealing with Horizontal Packaging Machines for Biscuit Industries and Soap Industries located at Vadodara. - We are also making Control Panels and take Automation Project for other fiels. We are offering a wide range of Flow Wrap Machine. Every HFW machine has different rate as per requirement. We are offering Automatic Flow Wrap Machine to our clients. We are offering Horizontal Flow Wrapping Machine to our clients. We are engaged in offering excellent quality Pouch Packing Machine to our valuable clients.
. 5 axis servo system with touch screen.
. 300 packs per minute production rate.
. Change over time less than 5 seconds.
. No Product - No wrapper interlock.